Price action traders can’t do without their trend lines. 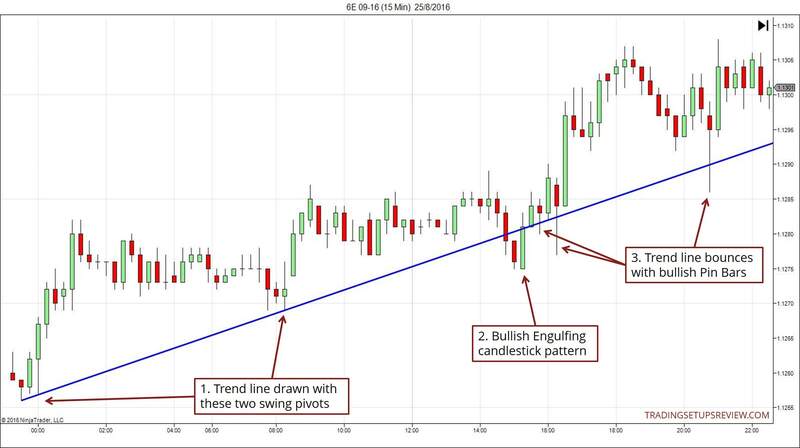 Trend lines are practical tools for tracking and trading trends. It makes sense to form trading strategies with this simple but useful tool. Many traders who seem to trade with a blank chart have in fact internalised the art of trend line drawing. They can visualise the trend lines with actually drawing them. Trend lines track trends. And when it comes to trading trends, you can go for retracements or reversals. You can work on the premise that the trend will continue or reverse. You can classify the four trading strategies below with this understanding. Here are the four trading strategies in detail. 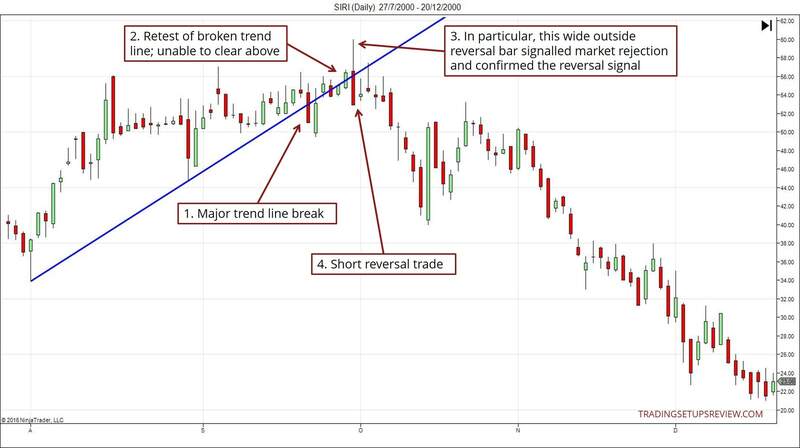 A trend line bounce is a classic pullback trade. The price action premise here is that the trend (as highlighted by the trend line) will resume. A bull market will bounce up from a trend line. Likewise, a bear market will find resistance and bounce down from a bearish trend line. There are two approaches for this trading strategy. The more conservative method is to wait for a confirming price pattern to form. An example is shown below. The more aggressive method is to enter wit a limit order once price hits the trend line. It allows you to enter at a better price if the trend does resume. However, as it lacks confirmation, its probability of success is generally lower. If you use a limit order to enter, consider using a volatility stop-loss. In this context, you are looking for a minor trend line that goes against the trend. The beauty of this trading strategy is that it uses a single trend line for two purposes. The same trend line defines the retracement and triggers the trade. 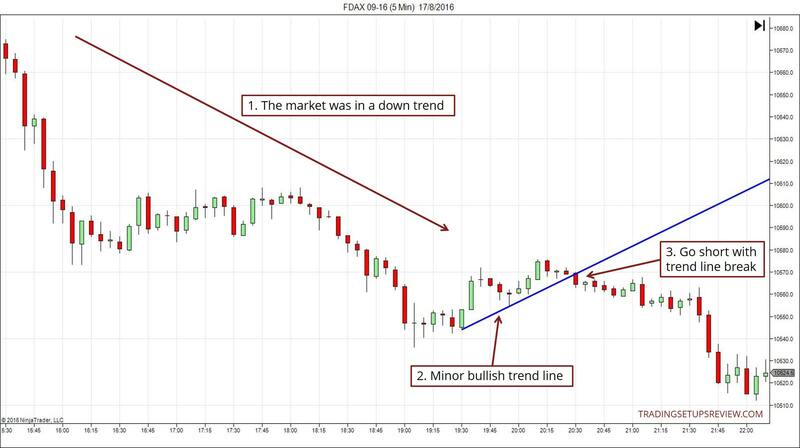 As shown in the example above, this trading strategy leads us into the market on the side of the major trend. The trigger is the break of the minor trend line. Let’s drill into the specifics of the trigger. There are several definitions of a trend line break. To use it as an effective trigger, you must know which one you want to use. Waiting for a price bar close to confirm the trend line break works well. But there’s a drawback. In volatile markets, you might not be able to enter before the trend pushes to a new extreme. This trading strategy is conservative because it requires a minor trend line to form against the current trend. For that to happen, a more complex retracement must be present. At least, it must be a two-legged retracement. However, the aggressive and conservative labels for retracement trades are not absolute. It depends on the actual price action and the way you draw your trend lines. It is possible that a trend line bounce setup is a more conservative strategy. For a retracement trade, the guideline is that the deep retracements mean conservative trades. A major trend line tracks the trend. Thus, when it is broken, it is a technical reversal signal. The chart above shows a great example. While it might suggest that this strategy is perfect, it is far from it. In fact, the trend line tracking the market had been broken many times without reversing. Established trends seldom reverse sharply without any other signals. Usually, you will find climatic volume and price movement before a sharp reversal. Use these signals to augment this trading strategy. You can also use divergences or other reversal trading tools with this trading strategy. The key point is that it is an aggressive reversal trading strategy. Don’t use it in isolation. In this trading strategy, we don’t go short once the trend line is broken. Instead, we give the market a chance to resume the trend. If it cannot do that, then we enter into a reversal trade. This is why it is a more conservative strategy. Let’s see how it works in the chart below. What you want to see here is an inability of the market to rise above the broken trend line. 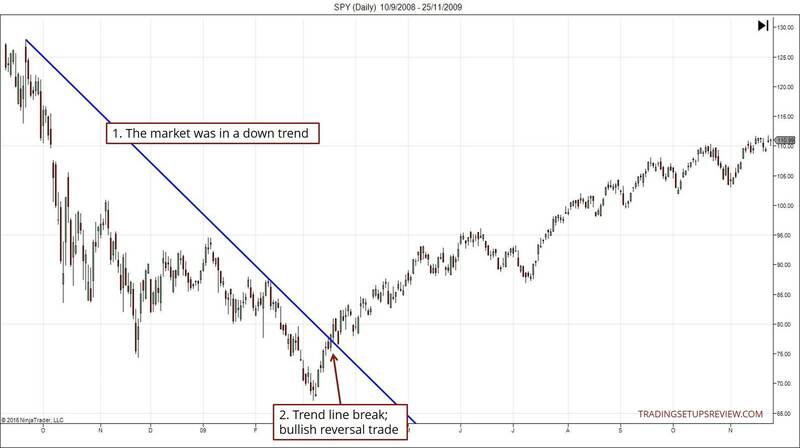 If a broken bullish trend line resists the market from rising higher, a reversal is likely. Thus, here, a close examination of the price action upon the retest is pivotal. In the chart above, the prior sideways action and the rejections from the trend high are telling. Taken together, they show that the market has difficulties resuming the bullish trend. Hence, a reversal trade is sensible. Sharp reversals are possible but unlikely. When you catch them, your reward is huge and comes swiftly. But if you are patient and are willing to skip the sharp reversals, this retest strategy is for you. 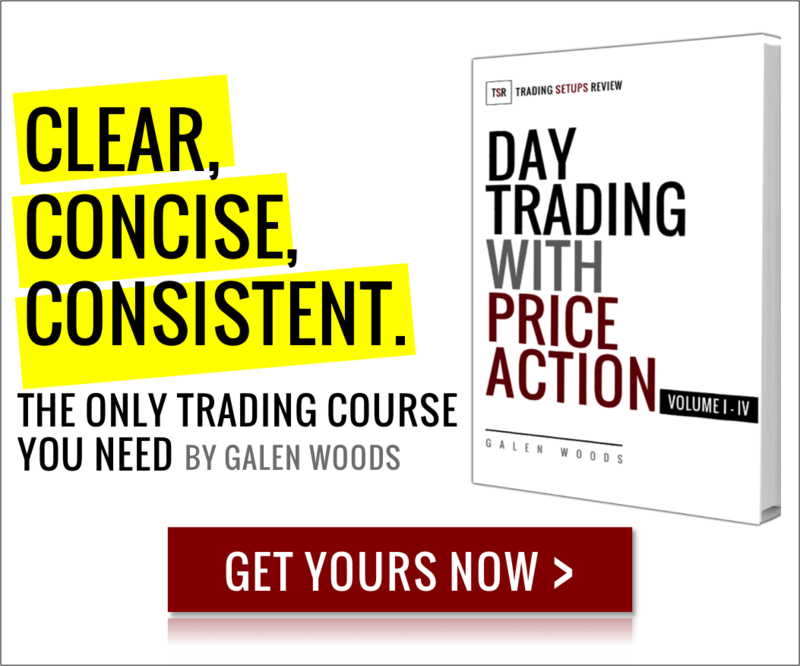 Experienced discretionary price action traders will find that these strategies are all they need. These four trading strategies are far from perfect. But they provide a basic template for building your trading strategy. For any trading strategy to work, you must be consistent. Do not draw trend lines in a haphazard manner. Stick to a set of clear rules for drawing your trend lines. All trend lines in this article are drawn with objective rules taught in my trading course. You need not use the same rules, but stay consistent with your chosen method. thank you very much for this four strategies. you are the best teacher on the world. Thank you for your kind words. All the best to you!